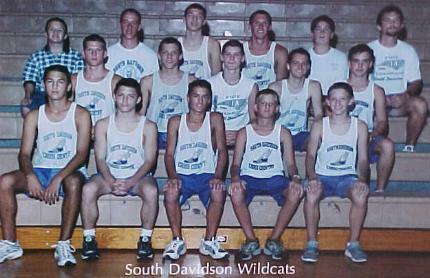 The 2001 season for Cross Country Wildcats. The men were 6th at the West Iredel Invitational. Then the boys went to the Graham Invitational on Sept.9 came in 1st. At thecounty meet the boys came in 1st, 1st in the conference, 2nd in regionals, and 3rd in the NC State Finals at Mclapine Park. The boys that made all conference this year of 2001 was Brandon Beddington, Lee Hamilton, Josh Jordon, Patrick Hogan, and Brandon Harris. All Davidson County the year 2001 * Brandon Beddington * Lee Hamilton * and Josh Jordon.